The Iwokrama International Centre continues to reach out to special needs groups in Guyana in an effort to ensure that all Guyanese are informed about its programmes of rainforest and biodiversity conservation and sustainable development. Last Friday, Dr Raquel Thomas (tropical forest ecologist and Director of Resource Management and Training at Iwokrama) together with Daisy Payne (a British volunteer with Iwokrama) held a ground breaking interactive session with the students of the Ministry of Education’s Unit for the Blind at Albert Street, Albertown, Georgetown. The Unit has been functioning since the 1980s and was housed at the St Roses High School in Georgetown, until it came to be housed at the Albert Street location in 2014. The Unit currently provides for the educational needs of 14 blind and visually impaired students. Five of the students attend the Unit on a full-time basis, while the others attend mainstream schools in the city but take classes at the Unit to reinforce their knowledge in various subject areas. “I believe that everyone has a right to learn about and understand the environment around them, particularly in a country like Guyana, which is so diverse in plants and animals,” said Ms Payne. “Some of the children were incredibly knowledgeable about their country but I am confident in saying that everyone learnt something new! The children were able to learn more about their environment, the history of protected areas and the animals of Guyana through touching, listening and engaging,” she added. Ms Payne noted that the students, as well as teachers, are now eager to learn more about Iwokrama and would even like to visit the rainforest to discover these national treasures themselves. 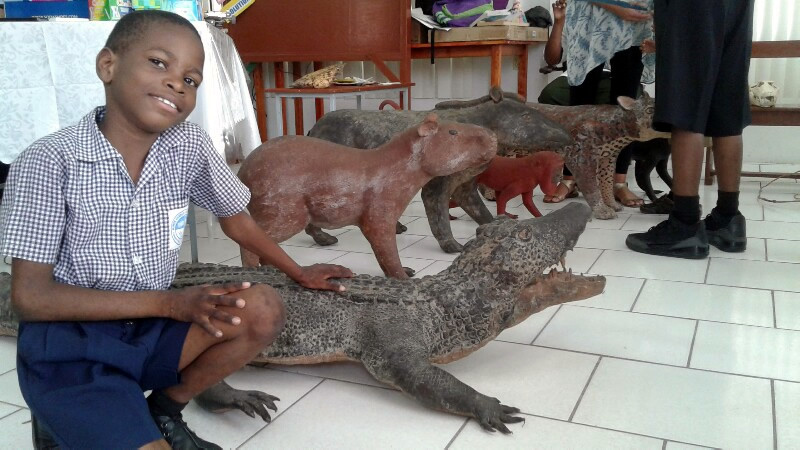 The Iwokrama team mainly used life-sized representations of various animals (made of balata), including the caiman, jaguar, monkeys, and the capybara, to help the students and teachers understand what the animals look like. After the interactive session, Ms Payne used an audio recording of the sounds of animals in the rainforest to quiz the students. “Honestly I didn’t know anything about Iwokrama until a few weeks ago when I met Raquel. I once had sight and so I know what certain animals look like, but I realised we are not conscious of the fact that those of us born blind have no sense of the world unless we experience it by touch or other means,” said Rosemarie Ramitt, a full-time teacher at the Unit. “Some of these children were born blind and this experience of feeling these animals created a whole new image in their mind. Can you imagine what it would be like if I describe an animal to you but you have no idea of what it looks like unless you get to touch it? This has definitely increased the imagination of our students,” she said after the conclusion of the session. June Herod, the Head of the Unit, was grateful to Iwokrama for recognising the need to held the students appreciate the animals of the rainforest. She said that the teachers at the Unit use various methods, including designing raised diagrams, so that children at least have a 2D vision of various lessons. The Unit currently has eight teachers; though they were not trained in special education, Ms Herod said they use their initiative, their creativity and whatever resources they have to teach the curriculum. “We do teach them about animals, but this experience, I can tell you, was very different. They were able to get a first-hand experience by being able to feel the animals in 3D. You could have seen the excitement in their expressions,” said Ms Herod. Iwokrama expressed appreciation to Conservation International-Guyana and Protected Areas Commission for providing some of the educational aids for the exercise.